The great Mahalia Jackson, whose multitude of fans will no doubt be celebrating the centennial anniversary of her birth on October 26 this year, was an African-American gospel singer. She possessed a remarkable contralto voice and rarely used it for anything other than singing sacred music. Referred to in her time as the Queen of Gospel, Jackson’s recording of Silent Night is even now regarded as the definitive interpretation. She also came to be known as an influential civil rights activist. The concert last Friday evening (15 April) was part tribute to her, part fundraiser for Vancouver’s Downtown Eastside Centre for the Arts, but mostly the fulfillment of the vision of event producer and featured performer, Dalannah Gail Bowen. Though originally from Winnipeg, she is a veteran of the Vancouver music scene. 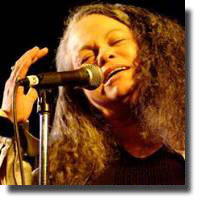 This multi-racial artist (she’s of African-Canadian/Cherokee heritage) is just as comfortable belting out the blues, swinging with jazz standards or lifting up her voice in gospel music. Marcus Mosely of the Sojourners welcomed the audience and introduced Ms. Bowen who kicked off an evening of inspiring music with In the Upper Room. I found some of the songs in the repertoire to be a little obscure, while others would certainly be heard in churches and gospel halls all over the Christian world. Such is the case with Were you there (when they crucified the Lord) a song often sung in churches during Holy week. The Sojourners provided luminous three-part harmony and testified that one doesn’t have to be a church-goer to appreciate or even take part in gospel music. Marcus Mosely and Will Sanders have been blending their gorgeous voices for what seems likes decades, though it looks like long time member Ron Small has been replaced by young vocalist, Khari McLelland. Bowen, who is now in her mid-sixties, showed she still has the musical chops to cover spiritual anthems like Joshua fit the battle of Jericho as well as giving a jazz treatment to Come Sunday with Michael Creber’s piano as her only accompaniment. St. Andrew’s Wesley Church may never have heard such a blast of joy than when what seemed like the entire audience joined in a jubilant sing-along at the end of the show with the traditional Down by the Riverside and When the Saints go marching in. It was clear that Dalannah Gail Bowen had put a lot of “blood, sweat and tears’ into this event. I’m sure that she believes it was all worthwhile.